Fans can't get enough of MJ and what better way to show your love than with a website. How do you honor arguably the most popular musician of our time? Create a website, of course. Since his death, Michael Jackson-related domain names have exploded, according to GoDaddy.com, an Internet domain name registrar. About 11,000 new domain names have been created since Jackson's untimely passing on June 25. “In the case of Michael Jackson’s passing, we saw an unprecedented spike ... and it has sustained,” GoDaddy Group spokeswoman Elizabeth Driscoll told The Business Journal. “The registrations are still pouring in yet today." That pretty much means you can type in any Michael Jackson-related name after "www" and you're likely to get a website dedicated to MJ. No matter the dot net or the dot com. And there's no telling the content you'll find. Some sights are selling memorabilia, while others were set up to organize beer toasts nationwide for the icon. WWW.weloveyoumichaeljackson.com? Yep. 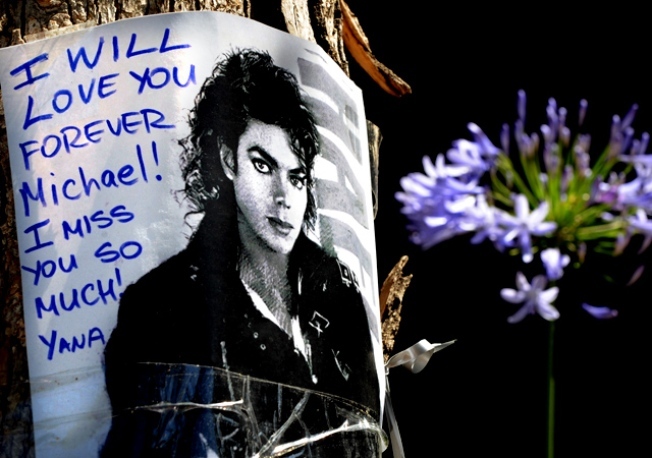 WWW.Inmemoryofmichaeljackson.com? You bet. Other celebrity death domains pale in comparison. Even an angel, Farrah Fawcett, only received a boost of about 100 websites using her name, GoDaddy officials said. Even in death, Jackson overshadows the competition.